LAVAL, QC--(Marketwired - September 29, 2016) - The Advanced Coronary Treatment (ACT) Foundation is pleased to announce that students from the Commission scolaire de Laval and the Sir Wilfrid Laurier School Board will benefit from lifesaving CPR and Automated External Defibrillator (AED) training, thanks to an additional donation from its national partner, Sanofi Canada, made on World Heart Day. The donation is a boost for the Laval component of the ACT Foundation's CPR secondary school program in Quebec, which is made possible through the support of both, health partners and the Government of Quebec. 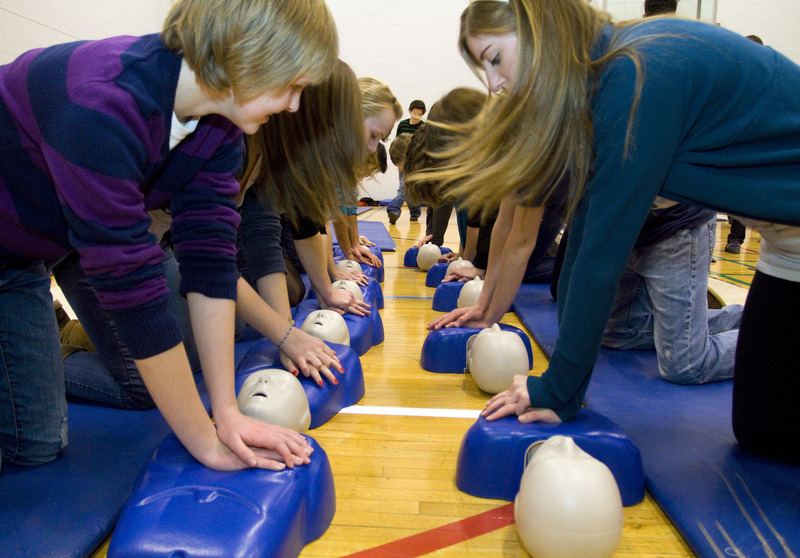 With Sanofi's support, the Foundation's lead Laval community partner, more than 2,500 students from the Commission scolaire de Laval and the Sir Wilfrid Laurier School Board will graduate every year with the lifesaving CPR skills and knowledge on how to use an AED. Funding will see all public high schools (with sec. III, IV, and V) receive training equipment, including AED training units and training mannequins, as well as teacher training as Instructors to enable teachers to train all students with the skills and knowledge to save lives. "As a founding partner of the ACT Foundation and a longstanding employer in the city of Laval, we are proud to make an additional financial contribution to the Foundation, so that local high school students learn the lifesaving skills of CPR and are trained to use AEDs. Sanofi has a long heritage in cardiovascular care and this is one way for us to give back to the community where we operate and where many of our employees live," says Niven Al-Khoury, General Manager, Diabetes and Cardiovascular Care and Canada Country Chair, Sanofi. The ACT Foundation is the charitable organization that is establishing free CPR and defibrillator training programs in high schools throughout Quebec and across Canada. ACT is working in partnership Sanofi Canada as a lead community partner for Laval to bring this program to all nine (9) Laval high schools: Centre de qualification professionnelle et d'entrepreneuriat de Laval, École secondaire Curé-Antoine-Labelle, École secondaire Georges-Vanier, École secondaire Horizon-Jeunesse, École d'éducation internationale de Laval, École secondaire Leblanc, École secondaire Mont-de-LaSalle; École secondaire Saint-Maxime, and Laval Senior Academy. For Louise Lortie, President of the Commission scolaire de Laval, the massive launch of this program in Laval high schools is not just an added value for the students, but also for the entire community. "Our schools are in the heart of Laval neighborhoods and they serve as a gathering place, for students, as well as for citizens. Our facilities and our equipment are readily available to the community. CPR and AED training, as well as the access to the medical equipment will enable us to save lives while contributing to the well-being of our community." With eight in 10 out-of-hospital cardiac arrests occurring at home or in public places, empowering all youth with CPR and AED training as part of their high school education will dramatically increase citizen emergency response rates over the long term. Early CPR combined with early defibrillation can increase chance of survival for cardiac arrest victims by up to 75% according to Heart and Stroke Foundation. "We are thrilled with Sanofi's support," says Sandra Clarke, the ACT Foundation's Executive Director. "With it, we can enhance the CPR program in Laval high schools with AED training, which is especially timely with AEDs becoming more available in public places. These are lifesaving skills that students will be able to bring to their current and future families and communities." To date, the ACT Foundation, with the support of its health partners, and in partnership with the Government of Quebec, has set up the CPR Program in 400 high schools across the province and more than 440,000 students have already been empowered to save lives with CPR. ACT is now enhancing the program with AED training for youth. The ACT Foundation is the national charitable organization that is creating a culture of lifesaving by establishing the CPR and AED program in all high schools. The program is built on ACT's award-winning community-based model of partnerships and support, whereby ACT finds local partners who donate the mannequins and AED training units that schools need to set up the program. High school teachers then teach CPR and how to use a defibrillator to their students as a regular part of the curriculum, reaching all youth prior to graduation. ACT's partners who are committed to bringing the program to Quebec are the Government of Quebec, and our national health partners, AstraZeneca Canada, Pfizer Canada and Sanofi Canada. To date, the ACT Foundation has set up the CPR Program in more than 1,700 high schools nation-wide, empowering more than 3.2 million youth to save lives. More than 2,500 students from the Commission scolaire de Laval and the Sir Wilfrid Laurier School Board will graduate every year with the lifesaving CPR skills and knowledge on how to use an AED.